But no matter your backyard situation — whether you have a teeny balcony, medium-sized patio, or sprawling lawn — there are plenty of easy, practical ways to store your landscaping tools, pool cleaning equipment, gardening materials, kids’ toys, and more. Read on for 18 bodacious backyard storage ideas, tips, hacks, and solutions that will transform your outdoor space into an organized, clutter-free paradise. You can re-purpose a narrow bookcase to make a padded storage bench . Just gather some foam, fabric, a can of paint, and bam — your tired bookcase is reborn as a dual-purpose seating area. Fill the cubbies in your bench with towels, blankets, baskets of gardening tools, or pretty planters. Tool sheds are a convenient, efficient way to store the equipment you need to maintain and spruce up your backyard — like lawn mowers, landscaping tools, planters, and hoses. Tool sheds don’t always feature a smart design on the inside but you can make a few basic changes to upgrade your tool shed. Tear out bulky shelves and install hooks and hangers to hold small gardening tools. Add wall hooks. Or hang a sturdy bin to store items like fertilizer and plant spray. A hanging organizer is the baking soda equivalent of organizing tools: It fixes every problem. You can use hanging organizers to store shoes, winter accessories, makeup, beauty products, crafts, and even cleaning supplies, so why not use them in your backyard, too? Stuff the pockets with your gardening gloves, clippers, plant stakes, twine, and seed packets, then hang it on the wall of your greenhouse or tool shed. It looks surprisingly chic sitting in your garden. Gather a few wooden crates (try your local farmer’s market or winery). Slap them with a fresh coat of paint. Glue them to a piece of sturdy plywood in the shape of a square. Add caster wheels, and voilà — you have a portable rustic coffee table with plenty of storage for bar essentials, gorgeous air-purifying houseplants, or maybe even some books. No more tripping over tricycles, toy cars, and skateboards scattered around your backyard. Corral your kids’ toys and gear in this mini covered kiddie parking garage. The DIY storage unit — built from PVC pipes, a corrugated plastic panel, and cloth — expertly hides your kids’ outdoor stuff, but is still easy enough for them to access. If your dilapidated, weather-beaten shutter is almost falling off its hinges, give it a new identity: flip it on its side, install a few hooks, and call it a shutter towel rack. You don’t even have to paint it or sand down the edges if you don’t want to. The ramshackle look will only add to its rustic, antique charm. Store the hose in a pretty outdoor planter. It’s simple, convenient, and actually looks good. Depending on your personality, backyard setup, and weekend routine, you might have a variety of different storage needs. You may need to store shovels, gravel, and extra terra cotta pots. Maybe you have to make room for pool tools and kids’ toys. Or, you may need a place to store your party necessities. Whatever the case, this gorgeous DIY outdoor buffet cabinet is just the thing you need to easily host dinners, brunches, and game nights al fresco. The buffet top serves as a mini bar, while the cabinets hold everything from candle lanterns to glassware. Cabin owners and mountain dwellers know how quickly a basic supply of firewood can stack up (pun intended) and take over your entire deck, patio, or garage. To prevent this from happening, invest a Saturday afternoon into constructing your very own stylish and ultra practical rolling firewood cart. It’ll help maximize your outdoor space and keep your logs organized. And did we mention it’s portable? Skip the heavy lifting and just roll your firewood wherever it needs to go. Have an old wooden plank laying around from your last DIY project? Give it new life as a simple garden tool rack. You don’t need a plain piece of wood, either. Repurpose an old coat rack, hockey stick, or longboard to add some personality to your storage. An outdoor storage bench is a no-brainer for your backyard. It’s a dual-purpose item that saves space, holds up to harsh weather, and looks great among your patio furniture. Especially if you build it yourself! Use it to store outdoor pillows, blankets for cozying up around the fire, games, pool toys, or towels. If you have enough seating space, it also doubles as a buffet table or drink station. If you don’t have enough surface area to spread out your collection of herbs, plants, and flowers, go vertical. All you need are some cinder blocks, heavy-duty construction glue, and a bit of imagination. Make your planter as tall or intricate as you like. And if you’re not a fan of the urban grey vibe, spray paint your blocks to match your outdoor decor. Pro Tip: Don’t stop with your yard. Give your home a green makeover, too. Here are the best house plants and planters for anyone who lives in a tiny apartment. Even your littlest tots will be able to declutter. Just pick up a few lightweight plastic bins to store your kids’ assortment of toys. Bonus points if they’re color-coordinated, stackable, and perforated so dirt and water can fall through the bottom. If you have an outdated armoire, bookcase, or cabinet in your home, don’t throw it away. Bring it to the backyard instead. A good scrub and a fresh coat of paint can transform an old cabinet into the perfect outdoor potting station. Store gardening gloves, tools, and seed packets in the drawers, then use the shelves and cupboards to hold bags of soil, pesticides, and extra pots. Put a fun twist on a classic storage bench. Use the open storage bench to slide in a couple of wooden crates that are perfect for storing blankets, towels, gardening tools, or kids’ toys. If the weather turns foul, simply carry the crates inside to protect your belongings. Even backyards have vertical storage possibilities. Just screw a couple hooks into your fence and hang a durable plastic bucket from each. It’s a simple, foolproof way to keep your kids’ toys organised and within easy reach. 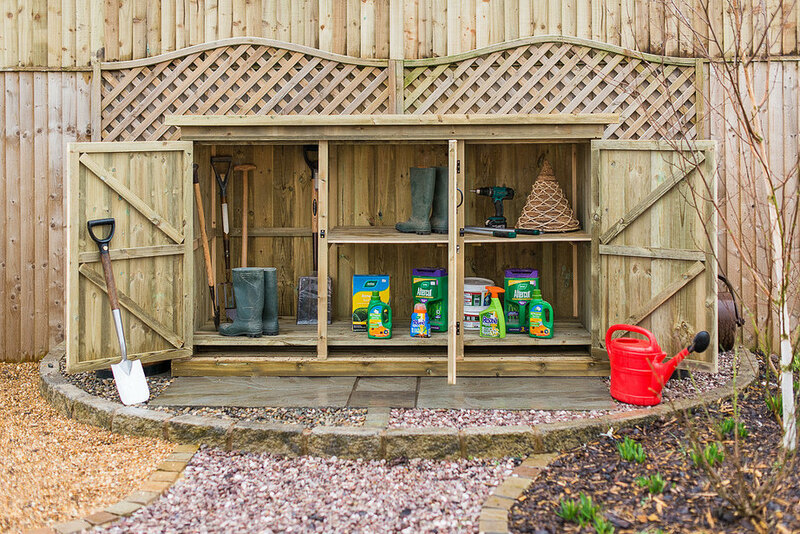 If you don’t want to create your own storage solutions, My Garden Storage offer a range of beautiful wooden garden storage solutions.